Hi there everyone. I would like to tell you about one of my favourite Aussie kids' authors, Elizabeth Honey. I love her name for starters, and she is a brilliant writer. As for favourite Aussie children's authors, I have quite a few and it would be hard to narrow it down to a top one hundred let alone a top ten, but if I had to, she'd be up there at the top! 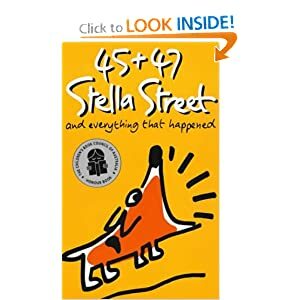 Last year, I read Elizabeth Honey's book "45 and 47 Stella Street and Everything that Happened." It is narrated by the heroine, an engaging girl named Henni Octon. She is tall and very funny and the story is written as if it is her book. There is a cast of family and friends who live in this close knit community, including Henni's irepressible little sister Danielle and electifying best friend Zev. They are all so believable and totally lovable. The trouble starts when a friendly old lady dies and some new neighbours move in to her house. The kids soon come to call these strangers "the phonies" and all sorts of adventures ensue. It is like a funny, modern, Aussie version of the Famous Five. Almost all of the pages contain cute illustrations drawn by Henni. After I had read it, I got hold of the audio book from the library, and played it in the car so my daughter could enjoy it too. Well, the nine year old absolutely LOVED it. She couldn't wait to hear some more, and asked me every time we got in if I could start the CD. The part she loved the most I think was the dog, Briquette, who has a bad habit of going through people's garbage and thus inadvertantly plays a part in unmasking the phonies. The audio book is read by Rebecca Smart, of "The Shiralee" fame, I remember watching her in Heartbreak High. She does a great job. In conclusion, it is a funny story about ordinary kids in an ordinary street who have an adventure and prove that they are not so ordinary after all. Parents and kids of kids in year 3 up will really enjoy it. It definitely should be made into a movie, and it features in "1001 kids books to read before you grow up"
Since then, we have listened to the third Henni Octon story, "The Ballad of Cauldron Bay" and we are currently reading the second one "Fiddleback" at bedtime. More about this later. 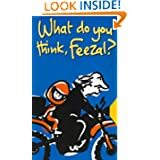 "What do you Think, Feezal?" This book is about a girl named Bean whose rich parents mostly leave her alone. She finds out she is going to be kidnapped by reading a book, which strangely enough is another Elizabeth Honey book. Tom Stoppard, eat your heart out! I really really enjoyed this exciting story, but the Pickle (that's DD) thought it was a bit scary. The "Feezal" in the title is a little doll made out of sticks who the main character talks to throughout the story. "The Cherry Dress" When the Pickle was little, we saw this read on Playschool. A lovely story about a girl whose favourite dress gets smaller and smaller until it no longer fits. 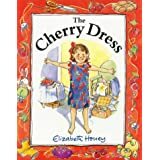 We both really liked this story, and it brought back memories of a cherry dress I had as a preschooler, which was actually a nightie. It lived in the dress up box for a long time after I grew out of it! 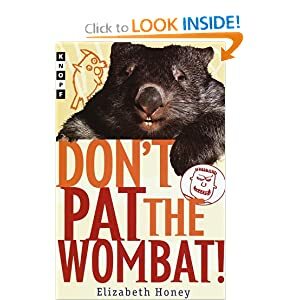 "Don't Pat the Wombat!" is a gross story about kids on year 6 camp. I think year 6 kids would like this one a lot. I did not let the Pickle read it as it has toilet humour and the kids don't respect their teachers. It is rather like Morris Gleitzman or Paul Jennings in style. There are black and white photos as well as line drawings. It is pretty much exactly what year 6 camp is like...and I oughta know, I've been on about a hundred of them. 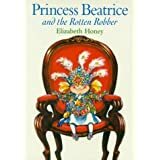 "Princess Beatrice and the Rotten Robber" another picture book. The Pickle didn't like this one much. The Princess is kidnapped by the robber, but she tricks him and ends up making him polish her jewels. This is the book Bean is reading in "What do you think, Feezal?" and it helps her outwit her kidnapper. Cool! I'm going to have to gather my 16, 18 and 20 year olds around and read to them just for fun....lol. Not thinking that would go over so well. I miss these times. They sound great! I'd never heard of her before. Great books -- too bad I don't have any little ones to buy for! My granddaughter is too little for these - but I shall make a note of the titles and refer to it as she grows. Thanks.